We found Ovation through a neighbor who had some work done. We had Rick come and review a potential project. Jason and the rest of Rick's crew were always on time. They were very fast and yet the workmanship was spot on. They cleaned up after themselves everyday. Project was finished on time. Final results were outstanding! Would definitely recommend. We hired Ovation Restoration for a bathroom restoration we planned on doing ourselves, but never had the time or skills to complete. Rick Arnold is honest and straightforward. Communication was top notch and managed expectations perfectly. Josh and Jason were presented with several inside-the wall challenges which they met as true professionals, knowledgeable about each aspect involved, tile, plumbing and electrical. They explained the issues clearly along with their game plan for getting over the hurdles, which they did exactly as planned. Also evident was a strong work ethic, showed up on time every day and busted it straight through every day till 5, and accommodated our schedules when we needed. The amount of progress these folks made each day was amazing. They also treated my home with respect, in preparation, daily cleanup and after the project was done. We ended up with a beautiful bathroom completed by artisians and it shows. Worth every penny. Without hesitation I would recommend Ovation Restoration. Job well done. Excellent job by the workers, and Rick Arnold was stupendous in his communication, his response time and flexibility excellent. Love the bath! Rick Arnold with Ovation Restoration managed my project, with the 3-man team of Stewart & Rose doing 98% of the work. The kitchen and two bathrooms were totally remodeled, and new flooring laid in most rooms. They far surpassed my expectations. These guys are awesome! Rick communicated well and smoothed out any blips quickly and cheerfully, and we never seen three guys work longer or harder, non-stop all day every day while still providing fabulous quality results. Josh, the owner of Stewart & Rose, is incredibly knowledgeable and versatile. Jason's attention to detail is intense, and his tile work is magic. Josh the helper is cheerfully willing to do everything asked of him. They came in under time and on budget even with five days of snow and ice. Try cutting tile with a wet saw in 13 degree weather. 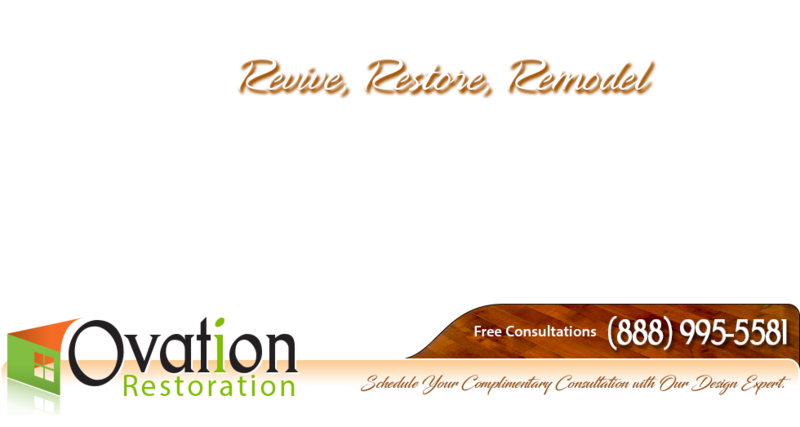 I have no reservations about recommending Ovation Restoration and Steward & Rose for your remodel project. Rick, Josh and Jason plus a couple others turned what seemed like a hopeless bathroom Into the shining star of the house. Together, they overcame the challenges of what a century old home could throw at them and boy, were there A few. Not to mention putting up with me and The request I made of the design. Job well done. Regards, Jay N.
Siding installation was finished ahead of schedule. Installers were friendly and professional. From the beginning, Manager Rick made sure he was totally in tune with what I wanted by taking copious notes. The "workers" Josh, Josh and Jason magically appeared as 1, 2, or 3 of them were required to finish each element of the job, Rick reviewed results each day and followed up on each detail to be sure I had no concerns, and someone was always there promptly on time in the morning and all always on task. The workmanship was extraordinary - complete attention to detail from largest issue to make both the outside and inside walls were totally pristine after a major change from a bedroom wall to (beautiful) patio doors with attractive casing - to the smallest careful line of grout in the bathroom. The personalities of all involved were respectful, good humored, taking pride in providing a result that met my vision as the owner - which was to have a bedroom, bathroom restoration that provided an enhanced appearance and met a personal need for a safe emergency exit if ever needed...and it all turned out even better than I imagined. Completed work as requested. Rick and subcontractors were great to deal with. Rick and his foreman, Chris, were very professional. Both were readily available whenever I had questions. We had a large floor tile job that got unexpectedly delayed by over a week due to freezing temps. While quite disruptive (we had to rent additional days for hotels and dog boarding), they did all they could to minimize the impact to our living spaces. They not only didn't pass on their overrun costs to me, they actually took some off the bill for our troubles. The new tile looks great and I'm pleased with the finished product.